Keosauqua, Iowa July 18. 42 Dear Mama I wrote Daddy today. I received a card from him Thur's & your letter Wed. I am just fine. am getting a good suntan, haven't gone swimming yet but will go Sun. We are going to Oakland mills Sun to fish & play in the water, we are going on a picnic. We are washing again today. Paul is helping to put up hay. How is Cliff, Carol, & Ruth. 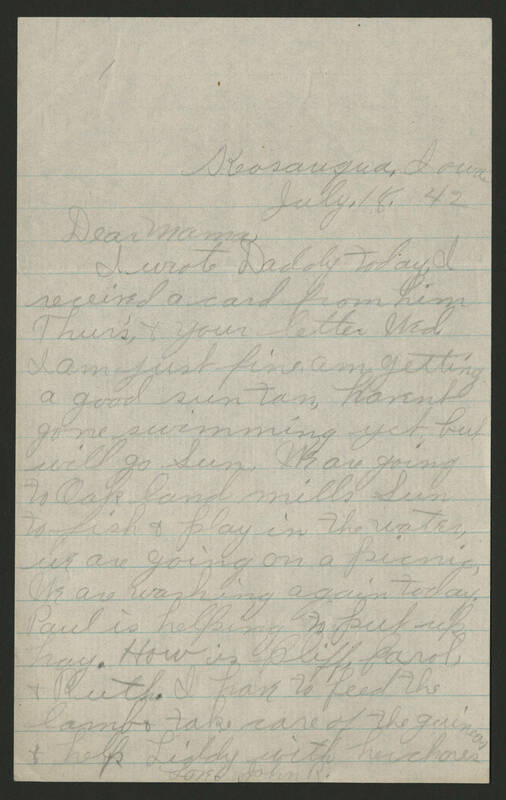 I have to feed the lamb take care of the guineas & help Liddy with her chores Love, John R.